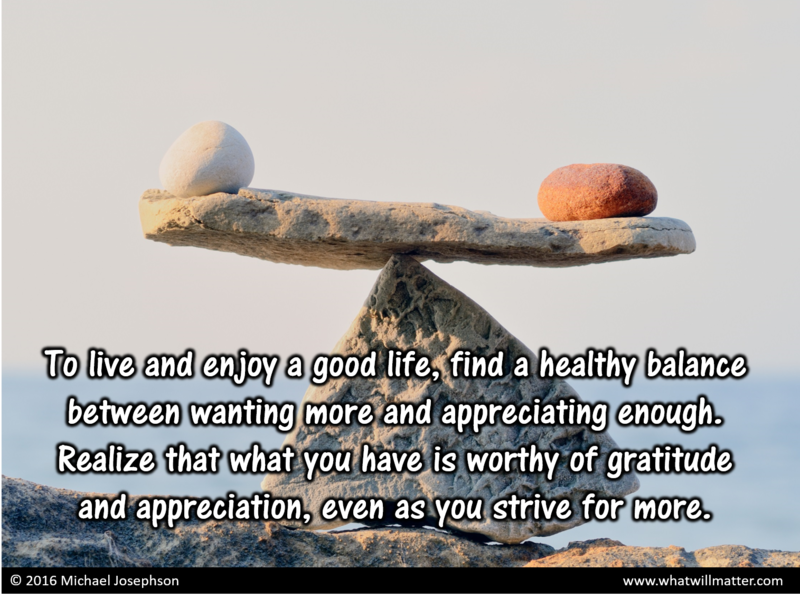 Living a Life That Matters COMMENTARY 971.3: FINDING A HEALTHY BALANCE: To live and enjoy a good life, find a healthy balance between wanting more and appreciating enough. Realize that what you have is worthy of gratitude and appreciation, even as you strive for more. It’s both a strength and weakness of human nature that we’re never satisfied for long. Whatever we have, wherever we are, most of us want more and better. When focused on money or power, our insatiability can turn into happiness-crushing greed, avarice, and obsessive ambition. But in many other areas of our life, our desire for more and better can be a very good thing. For example, in business we should continually strive for improvement and innovation. Similarly, when we assess the quality of our educational or healthcare systems, government integrity or efficiency, or the general state of social justice, we should never be satisfied. Even in our personal lives, we should strive for better relationships by improving communications and organizing our lives better. And there’s nothing wrong with wanting a better job, one that’s more intellectually challenging, emotionally rewarding, financially remunerative, and socially significant. To live and enjoy a good life, we need to find a healthy balance between wanting more and appreciating enough. You see, it’s possible to realize that what we have is worthy of gratitude and appreciation, even as we strive for more. Not being satisfied doesn’t have to be the same as being dissatisfied. Dissatisfaction is a negative state of mind. It’s a form of unhappiness. Thus it’s important to find a comfortable place between satisfaction and dissatisfaction. That place can be the state of contentment marked by true appreciation of what one has and the ability to enjoy it. In the progression of good, better, and best, better and best are superior to good. But good is still good. Enough can be good. Michael, we get caught up in this thing about wanting more. Unfortunately most Americans do not truly understand struggle or hard times. I have gotten used to my standard of life now, but it did not start out this way for me. I remember a time when I was in my teens me and my brother found 7.00 dollars worth of change in a ditch we had to resist the challenge of being selfish and buy enough food for the whole family. I have seen struggle worst than that overseas. I was in the military and what we call 3rd World countries, I saw people living day by day. That was a real eye-opener for me to saw a child selling gum to tourist to feed her family. Wonderful article Mr. Josephson. Most of the time your articles come into my life when they’re most needed. This one is no exception. Thank you for the part you’ve played in opening my eyes, my heart, and for making me a person of character. So very well stated and an excellent read that provokes one to examine oneself and decide to strive for balance in what we have, do and hope for. It defines who we are. Proverbs 30 addresses this on a spiritual level. . Thank you for your cheerleading, your correction and your good sense….sending you Aloha today. Interesting commentaries in your postings. My post earlier this morning is from a different perspective but a good balance in life would certainly result from doing the right thing. And the focus would not be on material gains. author of several things on the world of performance improvement, if interested I’m sure you can find them.